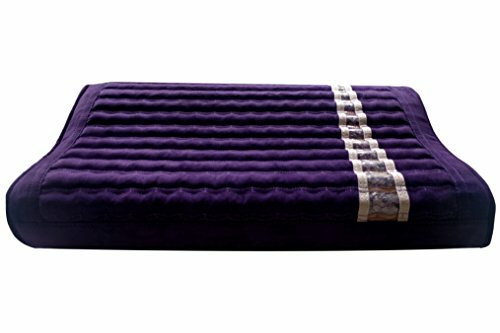 This FIR Pillow in Purple eco-suede forms the luxury set with the matching color MediCrystal Amethyst Agate Mat but can also be used with other Hot Stone Mats or just to sleep and relax. 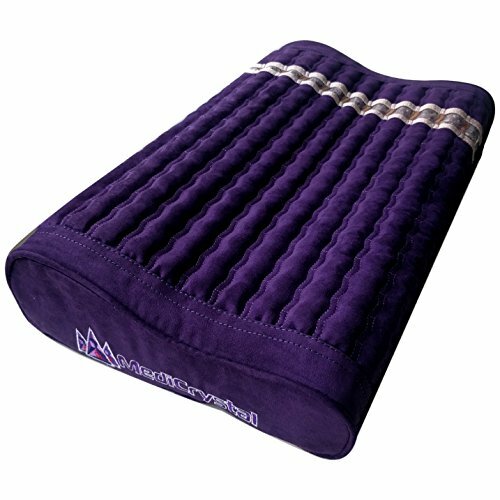 It is a GENTLE SUPPORT SOFT memory foam pillow 20x12x4 inches with 2.7 pounds of natural Amethyst gems. 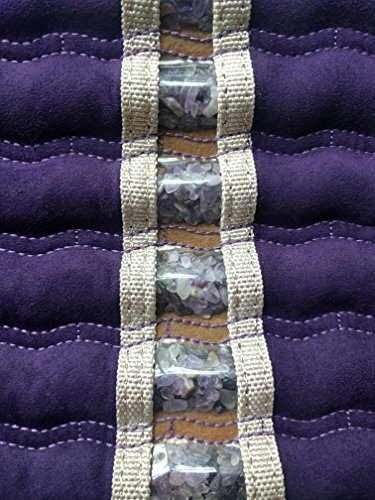 The beautiful wave lines design is featured with transparent triangle line showing Amethyst crystals, abundant under the entire wavy surface across the pillow. The pillow provides head and neck support for FIR heat therapy sessions. It recaptures Far-infrared heat from the Amethyst Mat and radiates it at a lower intensity. It is particularly beneficial when using the mat at high heat levels. Non Powered Pillow naturally releases Far-infrared rays and Negative Ions in safe and delicate way. While sleeping it can absorb the excessive heat from the too hot zones of your head and return it to those areas which need more warmth and better circulation. The pillow is great for healthy sleeping and relaxation. 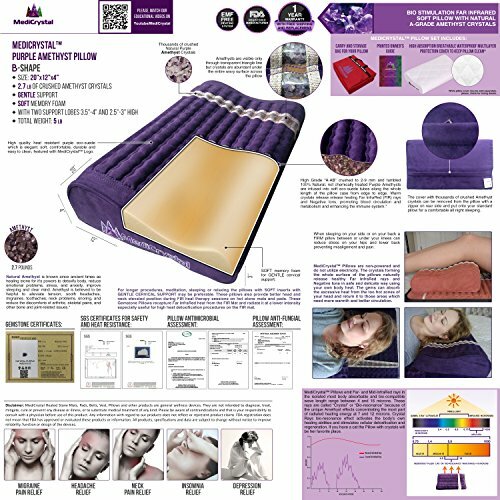 But if the heat resistant memory foam insert is not enough comfortable you can still use the removable pillow case with crystals on your own pillow. Amethyst pillow helps to reduce emotional problems, anxiety and depression. It protects from bed mite, molds and bacteria growth, shields your head from electromagnetic waves and water veins radiation. 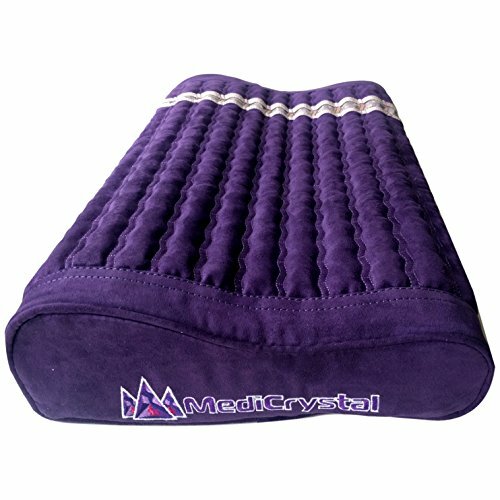 MediCrystal Pillow is great itself and as addition to all Amethyst mats for use in home and professional setting. Your purchase is completely Risk Free. We are sure you will love relaxing and soothing effects of your pillow and will sleep better every night or we will refund your purchase price. Revitalize yourself with a half an hour evening session. Click on the BUY button now to Sleep Better and Wake Up Energized! 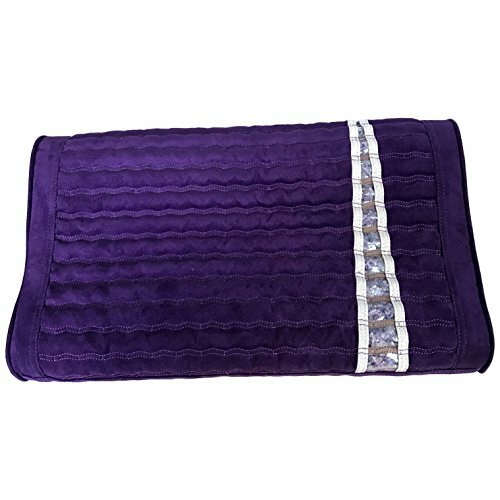 This High End B-Shape Pillow 20"L x 12"W x 4"H contains around 2.7 pounds of 100% Natural Purple AMETHYST gemstones of Brazilian origin known for ability to emit FIR crystal rays and generate negative ions. The total weight of the pillow is around 5.5 pounds. There is a zipper on the back side of the pillow case to remove insert. 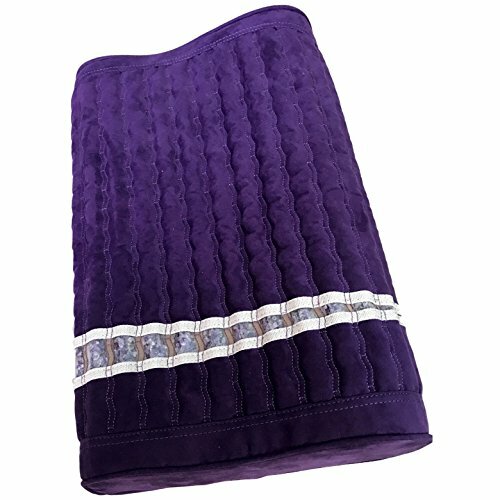 The cover is made of luxury eco-leather soft but yet durable matching color of the Purple MediCrystal Mats collection. MediCrystal FIR Amethyst Pillows come from FDA registered manufacturer. 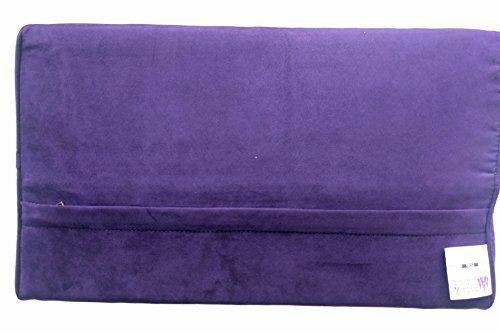 It consists of 2 parts, the core insert made of special heat resistant REGULAR memory foam for GENTLE cervical support and the valuable cover with precious natural tumbled crystals of natural Amethyst infused along the whole length of the pillow case. You can take off the case with gems from the pillow insert and put on your own pillow. For better FIRM cervical support you can chose our hard pillow. The soft core pillow is preferable for long use, sleeping or relaxing, It holds head and neck in elevated position during FIR heat therapy sessions on hot stone mats and heating pads. 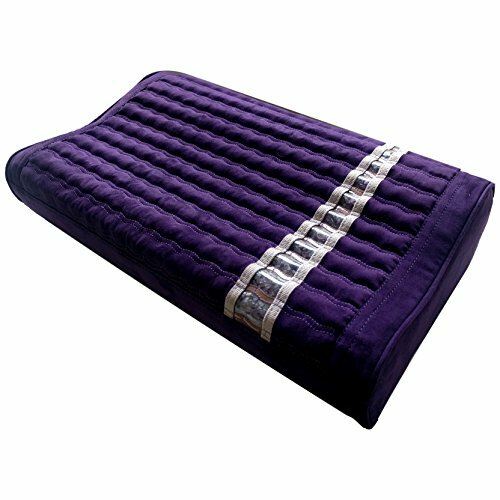 Amethyst Pillow recaptures Far-infrared heat from the FIR Mat and radiates it at a lower intensity particularly beneficial for high heat detoxification procedures on your MediCrystal Amethyst Mat at high heat levels. 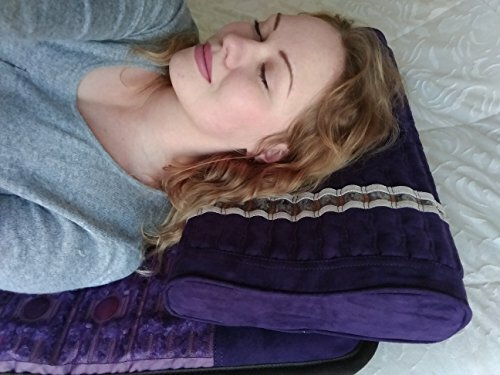 Also great to use the Amethyst Pillow without the heating mat for more relaxing and restful all-night sleep to have more positive emotional state and protect both body and mind from EMF, underground water veins, bed mites, bacteria and molds. These pillows with healing gems are effective for neck, back and joints issues. Gentle pillow may work better for sleeping on your side, or belly. MediCrystal Gemstone FIR Pillows are non-powered and do not utilize electricity. The crystals forming the whole surface of the pillows naturally release healthy Far-infrared rays and Negative Ions in safe and delicate way using your one body heat. The gems can absorb the excessive heat from the too hot zones of your head and return it to those areas which need more warmth and better circulation. If you have any questions about this product by MediCrystal, contact us by completing and submitting the form below. If you are looking for a specif part number, please include it with your message.